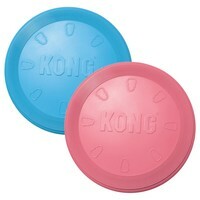 The Kong Puppy Flyer Frisbee has been made from a soft, yet durable rubber that is especially suitable for puppy teeth. Because the Puppy Flyer is soft it avoids common problems with other dog discs that can cause cuts to the dogs mouth, or become hard for the dog to pick up. Perfect for teaching your growing puppy how to fetch and retrieve. Please Note: This product is available in different colours which unfortunately cannot be guaranteed.